Robert Sayer, the surveyor, traded as a map publisher and print seller in Fleet Street in the latter half of the 18th Century. 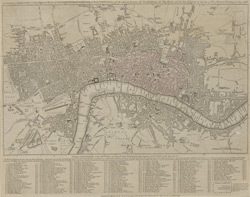 Between 1751 and 1770 and again from 1784 to 1794, he published maps under his own name or under the imprint of Sayer and Bennett. This is the 11th edition of a map published 14 times over a period of 27 years. During this time Robert Sayer became joined in partnership with John Bennett, with their joint imprint appearing on the third to eighth editions. The area of the city is highlighted in pink. A table of references for churches and public buildings appears below the map. In 1794 Sayers stock was acquired by Robert Laurie who founded the map publishing firm of Laurie & Whittle, with his friend James Whittle.